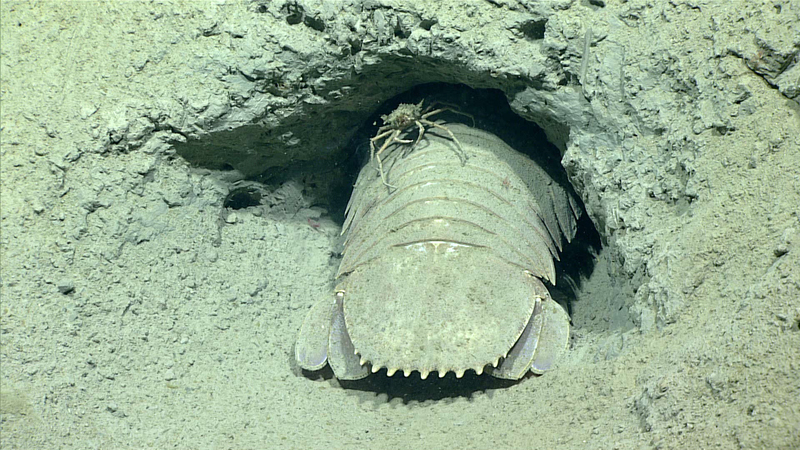 The giant isopod, Bathynomus giganteus, at its burrow tunnel, accompanied by a hitchhiking spider crab, at a depth of 545 meters (1,788 feet). Image courtesy of the NOAA Office of Ocean Exploration and Research, Gulf of Mexico 2017. Download larger version (jpg, 1.2 MB). 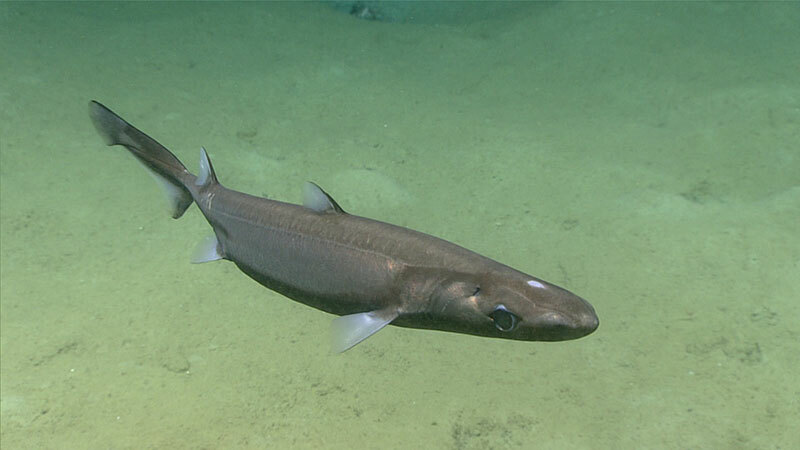 A small shark, perhaps the black dogfish, Centroscyllium fabricii, at a depth of 601 meters (1,972 feet). Image courtesy of the NOAA Office of Ocean Exploration and Research, Gulf of Mexico 2017. Download larger version (jpg, 603 KB). 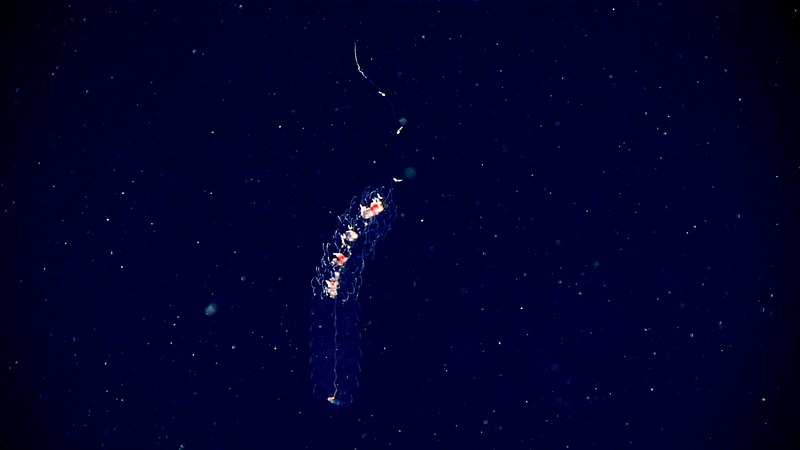 A siphonophore imaged during one of our midwater transects. Image courtesy of the NOAA Office of Ocean Exploration and Research, Gulf of Mexico 2017. Download larger version (jpg, 597 KB). While exploring a site referred to as "Gulfoil/MC796," we had this rare encounter with a swordfish feeding. Video courtesy of the NOAA Office of Ocean Exploration and Research, Gulf of Mexico 2017. Download larger version (mp4, 26.2 MB). We started today’s dive at “Gulfoil” at a depth of ~615 meters (2,018 feet) on a heavily bioturbated, sedimented seafloor. During the entire dive, only two areas of hard substrate were encountered. Many of the species observed were seen multiple times, indicating an unvarying community. We observed crustaceans, including squat lobsters, crabs, and giant isopods (Bathynomus giganteus) in burrows and depressions, as well as partly buried in the sediment. At least two species of cerianthid anemones were also abundant throughout the dive, and we also saw several deposit-feeding ophiuroids, sea stars, and holothurians. Fish were the second most abundant group of organisms encountered. The two small pieces of hard substrate encountered during the dive were colonized by barnacles (Arcoscalpellum regium) and anemones (Hormathiidae sp.). The lack of hard substrate resulted in actiniarians and zoanthids attaching to other species. Following the benthic portion of the dive, we conducted two exploratory 10-minute midwater transects at 400 and 300 meters (1,312 and 984 feet) depth. While many observations were made during the transects, the constellation fish, Valenciennellus tripunctulatus, was particularly exciting to the team. Characterized by dense marine snow, both midwater transects featured abundant midwater life.